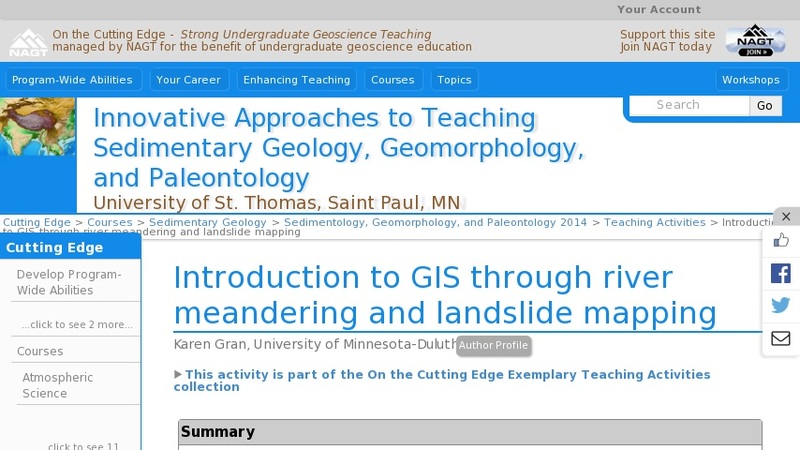 The primary goal of this lab is to develop basic ArcGIS skills for geomorphology students and give them a taste of what is possible in GIS. The lab is written for the GIS novice, and thus includes detailed instructions for small tasks. The GIS basics are taught via an exploration of river meandering and bank and bluff erosion in a local (turbidity-impaired) stream in Duluth, Minnesota: Amity Creek. The students visited Amity Creek the previous week and mapped in all locations along the river corridor with clear evidence of recent landsliding. This lab leads them through how to bring those field-collected GPS data into ArcGIS to both create maps and make measurements. They also look at river meandering over time at a single site where recent bluff stabilization work was completed to slow channel migration and lower the amount of fine sediment from entering the stream. This lab could be adapted to other locations, although I have also included all of the data specific to this site.